This brand new animated Nickelodeon DVD from the half-shell heroes is entitled "Blast To The Past" and to be honest that is very appropriate as I remember the Ninja turtles from my own youth! So-you are invited to take a turtle-y awesome trip (groan!) 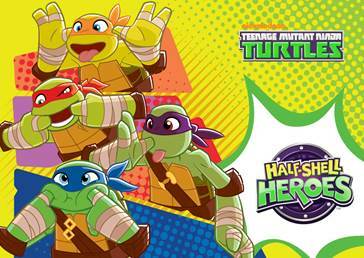 back to the time of dinosaurs with "Half Shell Heroes: Blast To The Past" with Leo, Donnie, Raph and Mikey the animated mutant ninja turtles. Riding high on the success of the blockbuster movie currently showing in cinemas this dvd (released in May 2016) is more suitable for younger viewers caught up with turtle-fever. In this film the half shell heroes make new dino-sized allies, battle aliens from the future who are trying to rule the galaxy and then have to make their way back to their home and time. The DVD is rated PG (with mild violence) and runs for 42 minutes. My young film reviewers (aged 7-15) enjoyed the cartoon but felt it was probably best for younger fans. It is recommended for the pre-school audience and has lots of lighthearted laughs! You can buy "Blast To The Past" online or enter my competition to win one of three copies worth around £9.99 each. My best friends soon, he loves the turtles!